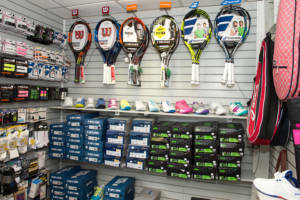 Our Pro Shop offers a full selection of racquets available to purchase for all player levels, as well as bags, footwear, accessories, and stringing services. Do you have a tennis racquet already? Have our Pros do a complimentary assessment of your gear to make sure you are using the proper size and intensity for your level! We carry major brands such as Wilson, Head, Gamma, Babolat, and many more. Be sure to stop by and check out what we have in stock. We can take custom orders as well!